Russia, the US and the European Union have said that all sides have agreed to steps to lower flames. Russia, the US and the European Union said Thursday that they have agreed to steps to "de-escalate" the crisis in Ukraine. Russia's Foreign Minister Sergei Lavrov announced that a deal has been reached with Ukraine, the US and the EU to 'de-escalate' dangerously high tensions in the former Soviet republic. Lavrov, US Secretary of State Johnn Kerry and EU foreign policy chief, Catherine Ashton, said there was agreement that all illegal military formations in Ukraine must be dissolved, and that everyone currently occupying buildings must be disarmed and leave the premises. They added that there would be an amnesty for all anti-government protesters under the agreement. These steps will be overseen by monitors from the Organization for Security and Co-operation in Europe (OSCE). Analysts say the outline agreement could avoid economic sanctions the West was preparing to impose on Russia. 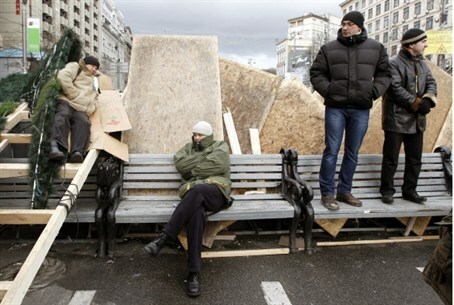 Ukraine has been in crisis since the toppling of its pro-Moscow president. Russia then annexed the Crimean peninsula – a part of the Ukraine but with a Russian-speaking majority population – in a move that provoked international outrage.